The Nokia 8 Sirocco is an expensive smartphone that does most things right, even the radical ones, but it still won't be for everyone. While the Nokia 7 Plus turned out to be the impressive mainstream, mid-range smartphone, the company’s 2018 flagship smartphone is just as interesting. A throwback to the original Nokia 8800 Sirocco, the Nokia 8 Sirocco is beautiful and unconventional. Despite playing it safe in 2017, everyone took notice when HMD Global started making Nokia smartphones. The nostalgia for the Nokia of old quickly turned into the widespread belief that this was just the start of another bright future for the Finnish brand. At MWC 2018, HMD unveiled its new portfolio for this year — a competent range of smartphones using Android One across the board. The Nokia 8 Sirocco model is shiny and solid, offering a pure and up-to-date Android experience. Does that merit its premium price tag though? Let’s find out in our full review! For the purpose of this review, I used the Indian variant of the Nokia 8 Sirocco and the same unit was used by my colleague Adam Sinicki for the video review in the UK. We’re holding off on adding final review scores until we can run the Nokia 8 through our full battery of Android Authority tests. Stay tuned. The Nokia 8 Sirocco has a refreshing but unusual design. It’s also quite divisive. Its combination of a stainless steel frame and Gorilla Glass 5 on the front and rear is sleek and looks exquisite. The elegant craftsmanship is striking and hints at a dependable construction overall. The curved display on the front flows through the left and right edges to meet the stainless-steel frame, offering a nice contrast with the black glass exterior. The glossy rear on the Nokia 8 Sirocco is quite a fingerprint magnet, although thankfully it’s not as slippery as some glass-backed phones. It’s stunning to look at, but the Nokia 8 Sirocco's design won't be for everyone. At 7.5mm, it’s a pretty thin smartphone. Its minimal bezels make it a compact but wider smartphone, especially since it doesn’t pack a tall display, opting instead for the traditional 16:9 aspect ratio. It’s stunning to look at, but the Nokia 8 Sirocco’s design won’t be for everyone. Its form factor and the eclectic design grew on me, but some might find it uncomfortable to actually use. The edges are quite sharp and dig into your palms. The buttons on the side sit nearly flush with the body and take getting used to. The wider display means it is harder to reach across the screen with one hand than a phone with a newer 18:9 display. Nevertheless, the Nokia 8 Sirocco scores high on aesthetics. It looks great, slides nicely into the pocket, and the build quality is solid. It’s made for those who prefer to stand out in the crowd, even if that requires a few days of courtship before confessing love. With the beautiful chassis, the Nokia 8 Sirocco also packs a gorgeous curved display. There’s a 5.5-inch QHD P-OLED display and no notch. The Nokia 8 Sirocco packs a gorgeous 5.5-inch QHD curved P-OLED display. The highlight of the display on the Nokia Sirocco 8 is how it curves around the edges, just like we’ve seen on Samsung’s flagship devices. The curved display looks beautiful, yet it is only for aesthetics, rather than offering any specific functionality. Multimedia content is a delightful experience, though, with videos flowing down from both sides while playing. The only problem with the curved display is that it causes a vertical blue tint on the edges. It isn’t a dealbreaker and you get used to it, but it’s quite noticeable, especially on lighter backgrounds. Overall, the display on the Nokia 8 Sirocco is sharp and vibrant. The colors are quite punchy, though definitely oversaturated, which will bother some. Even outdoors in bright summers, the sunlight legibility is great although I think the max brightness could’ve been a little better. The Nokia 8 Sirocco does not boast the standard top-of-the-line specifications one would expect of a flagship smartphone. It is powered by last year’s flagship processor from Qualcomm, the Snapdragon 835, instead of the latest Snapdragon 845 chipset that powers all the flagship smartphones of 2018. With its 6GB of RAM, the smartphone still delivers impressive performance that for all intents and purposes makes the choice of the processor a moot point. It offers a smooth stock Android experience, and it blazes through anything thrown at it, even graphically intensive games. Even after gaming for a stretch, the glass back doesn’t get too hot. There’s brute strength, yet remarkable efficiency here. In terms of performance, there’s brute strength, yet remarkable efficiency here. The Nokia 8 Sirocco also boasts 128GB of USF 2.1 storage. It’s not expandable, but that should be more than enough for most people. If the 2K display and the older processor make you worry about the battery life of the Nokia 8 Sirocco, don’t worry — the 3,260mAh battery is more than enough. Even with heavy usage, the battery easily lasts an entire day. There’s also support for quick charging which allows you to charge the phone from zero to 100 percent in about an hour and forty minutes, while you can quickly juice it up to 50 percent in just over 30 minutes. The Nokia 8 Sirocco is a reliably solid performer with excellent battery life. Like with the display, HMD Global placed confident bets on solid hardware choices that work well but that maybe won’t attract those who pick up smartphones purely based on specs sheet. The Nokia 8 Sirocco is a single SIM device, which makes it a no-go for many people in markets like India, where many users use a second SIM for mobile data. For people like me who use just one SIM or carry different devices for personal and work usage, it’s all good. The Nokia 8 Sirocco is a single SIM device, which makes it a no-go for many people in markets like India. The Nokia 8 Sirocco is IP67 rated for dust and water resistance which is always good to have, especially since we’ve seen several mid-range flagship smartphones skip the certification. The phone also supports Qi wireless charging — big props to HMD for that. I’ve always been bummed that Google Pixel devices do not support wireless charging, despite being top-of-the-line smartphones. While the wireless charging was a positive decision, we can’t say the same about HMD Global’s decision to ditch the headphone jack on the Nokia 8 Sirocco. You win some, you lose some. The Nokia 8 Sirocco packs a dual camera setup with Zeiss optics at the back, featuring a 12MP camera with f/1.7 aperture combined with a 13MP telephoto camera. There’s no optical image stabilization (OIS) on board, which is disappointing, but there is electronic image stabilization (EIS) to help stabilize your videos. There’s 2X optical zoom too, which is handy for capturing long distance shots. In good lighting conditions outdoors, the Nokia 8 Sirocco can capture some great photos with great contrast ratio and exposure. The color reproduction is solid, although some shots tend to be oversaturated. The landscape shots are pretty good, while the macros and bokeh shots are sharp and well defined. The edge detection and blurring of the background are first-rate. The camera focuses really quickly and the shutter speed is fast, which helps avoid shaky photos. While the dynamic range of the shots is very good in low light, there’s less detail and some noise creeps in. The absence of OIS is only really felt in tricky light conditions. You can check out our sample shots in high resolution here. The Nokia 8 Sirocco has a pretty good camera, but for a premium flagship smartphone, it doesn’t dazzle you in any way. There’s also the dual-sight mode, previously marketed as a “bothie,” which lets you take shots or record and stream videos using both front and rear cameras simultaneously. It’s an interesting option for vloggers or if you have kids and pets at home but is pretty pointless for most others. On the front, there’s a 5MP camera, which is definitely low on the megapixel count. Nevertheless, the front camera captures some great selfies in good lighting conditions. Again, in low light conditions, there’s significant noise. The highlight of the camera is the camera app’s Pro Mode. It allows you to manipulate settings like the ISO, white balance, shutter speed, and exposure, while getting a preview of the intended shot in real-time. It’s quite intuitive, and one of the best implementations out there. Don’t get me wrong, the Nokia 8 Sirocco does not have a bad camera. For most people, it would be a superlative experience, but at this price, it should be better. The combination of Nokia and Zeiss has given us striking imaging capabilities in the past, but the Nokia 8 lacks that wow factor. If the new Nokia is going to compete with the camera prowess of phones like the Pixel 2 it needs to do more. If the new Nokia is going to compete with the camera prowess of phones like the Pixel 2 it needs to do more. Overall, the Nokia 8 Sirocco has a pretty good camera, but for a premium flagship smartphone, it doesn’t dazzle you in any way. One unfortunately feels that HMD Global missed a trick or two here. The Nokia 8 Sirocco comes with stock Android 8.1 Oreo, which supports Project Treble. There are no customizations and no bloatware of any kind. It’s a minimalist Android experience out of the box – the kind of thing some of us love and others loathe. The Android One device will also get regular security updates as well as an upgrade to Android P.
Another software upside: HMD Global has a good track record for delivering updates quickly across its entire portfolio. A Nokia phone is the best deal apart from the Pixel devices for fans of a pure and up-to-date Android experience. HMD Global has a good track record for delivering updates quickly across its entire portfolio. The Nokia 8 Sirocco is an expensive smartphone that does most things right, even the radical ones. 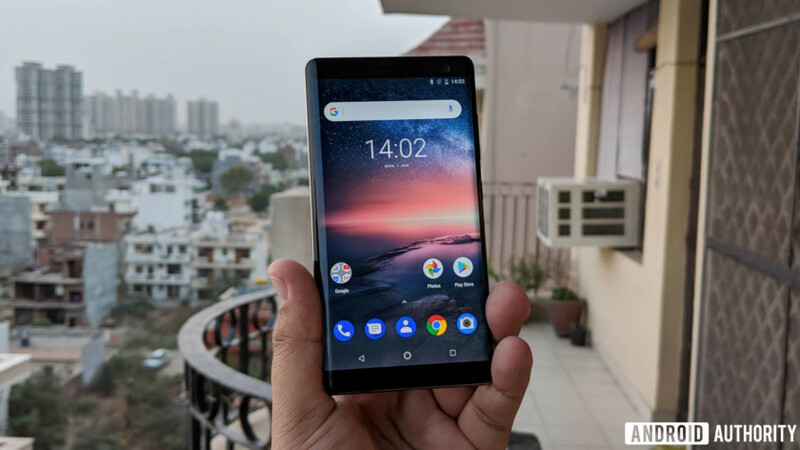 At 49,999 rupees (~$735) in India, the Nokia 8 Sirocco is an expensive smartphone that does most important things well. A better camera alone would’ve made it drool-worthy. Barring the Pixel line, there are almost no flagship smartphones that run stock Android, which makes the Nokia 8 Sirocco a great option for fans of pure and up-to-date Android experiences outside the Google ecosystem. The Nokia 8 is not a phone for everyone, though. Cheaper mid-range smartphones already on the market, including HMD’s own Nokia 7 Plus, would work for most people, but the Sirocco is for those discerning individuals who don’t mind paying a premium for style and an unconventional look. What do you think of Nokia’s latest? Let us know in the comments.